How to transfer ownership to a new email address & change your account password. If you want to change the email associated with the account for any reason or change your password, you can easily change it in your account! Here's how you can update your account email or password. Step 1: Login to your account and navigate to the menu in the bottom left corner of the screen and select "My Profile." 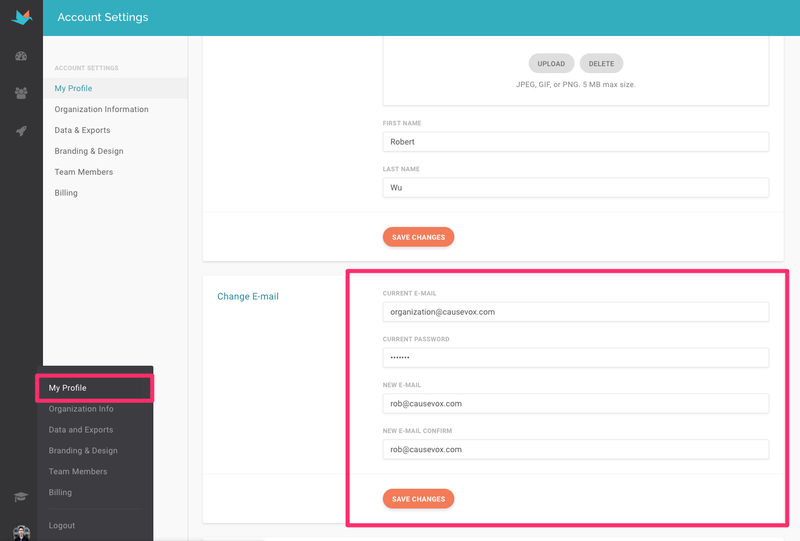 Step 2: Scroll down to the section labelled "Change Email" and "Change Password," respectively and input your desired email or password. If the email you'd like to transfer ownership to is already in use as an admin on your account, email us at support@causevox.com and we'd be happy to take care of transferring ownership for you.